Jumla is Swahili for ‘All together’. This word was the inspiration for the name of the open source project Joomla!. Joomla! is a fork of Mambo and the reason for that fork was that the lack of ‘jumla’ in Mambo. Open source software is about forking. It is sometimes useful to fork a project. Since I am involved in documentation of software I learned there is often a lack of it. Not in the sense that nothing is available. More in the sense that there is too much documentation and often it is not addressed to a specific target group. This has a lot do with the structure of open source projects. In Joomla! the release plan was changed dramatically. Nobody I speak to, trusted this new structure because in the past no plan or roadmap worked for Joomla! But this time it seems to be a serious effort. Joomla! 1.6 was released in January 2011, Joomla! 1.7 will be released at July 2011, Joomla! 1.8 or 2.0 (depends on many things) will be released in January 2012. What can you do as a technical writer in this situation? I thought about this in December 2010 and I came to the conclusion that it only makes sense to write about core and a few things around it. The most important thing will be, to keep things simple. I tried it and as you might know, I released an English Joomla! 1.6 book for free March 1th, 2011. I was simply blown away about the positive reactions to this step. It was ‘only’ a book for beginners and I even made a lot of typos and mistakes in the content because I am not a native English speaker and the Joomla! 1.6 version were simply buggy in the beginning.At the end of March 2011 the German version of the book was released by Addison Wesley in the usual way and it sells quite well. I received two types of reactions: The first one was “Wonderful, a short and easy-to-understand book as mentioned on the cover”; the second one was “What a bad book, it covers only core!”. I want to use this opportunity here to say thank you to Addison-Wesley, especially to Boris Karnikowski, that they released the book very fast in the way I thought of it. How to survive writing free books? The short release cycle and the fact that the English book was downloadable for free made me think of the question how to survive with this ‘concept’. I put the English book on Lulu to give people the possibility to buy a printed version and to pay something for the download version if they want to. I put AdSense on our website to earn the big money with Google Ads. 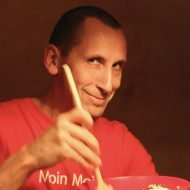 I put a Flattr Button to every chapter to try out other possibilities to earn money. Since a few weeks the book is available in the iBookStore. To make it short, nothing works so far really well. I received a few Euro and I still trust in the bright future of these possibilities, but at the moment it isn’t possible even to cover the costs. 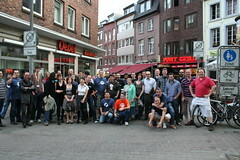 A few days before the international Joomla! conference jandbeyond in Kerkrade took place, I had the idea of selling chapters for advertising in the next Joomla! 1.7 book. At the conference I met many Joomla! component developers and sold easily all the chapters! Jumla! Thank you @inwend, @snipersister, @themigur, @hussfelt, @bloggerschmidt, @sigsiu, @ossupportdesk, @redwebdk, @FonnySmets, @thomaskahl, @thinknetwork, @johanjanssens, @joomla4all, @vdrover, @theFactoryRO, @techjoomla, @joomlapolis, @vistamedia, @joomlaworks, @2value, Andreas Kölln and Federico Cirillo! I’ve seen, on the one hand, so many people, who were and are happy with Joomla! and so many people who earn their income from Joomla!, and on the other hand, I’ve seen so many problems in different areas of the project too, where people are not working together. So maybe this book idea can make a win – win situation between fresh users, Joomla! as a product, third party developers and me and others as an author and translator. I am not keen on being the only author. Two chapters of the English Version will be written e.g. by Henk van Cann and Angie Radtke. The reader will have it for free! Third party developers are in the boat and can offer their services without influencing the content. Different languages are possible and help spread the word about Joomla! Does it work in Spanish too? At jandbeyond I met people from the Spanish community and they liked the idea too. As a result Isidro Baquero will translate the English Joomla! 1.7 – Beginner’s Guide into Spanish. The last point is crucial. Without a bit money involved it is not possible to create the Spanish version in the way we think. You are invited to become an advertiser and discover the possibilities of the Spanish speaking Joomla! world by booking your ad NOW. Since the famous ‘five chapter booking’ made by Ronnie Christiansen from redcomponent, I decided to drop the simple booking form and create a product in our shop (Spanish, English) to give the possibility to buy more than one chapter. Does it work in other languages too? What about Hindi, Chinese, Portuguese, Turkish, Arabic? Drop me a line if you are interested in doing a translation! If you have an idea for a cover, we would be happy if you contribute your idea! Concerning the ‘Selling chapters idea’ my prediction is ‘It will work too in the future’ if we do it ‘All Together’ and if there is not too much money involved and people are not becoming greedy. It is necessary to contribute to open source projects and it is of course necessary, too, to buy food. The dose of a substance decides whether it will heal you or whether you’ll die from using it. Let’s figure out the right dose!